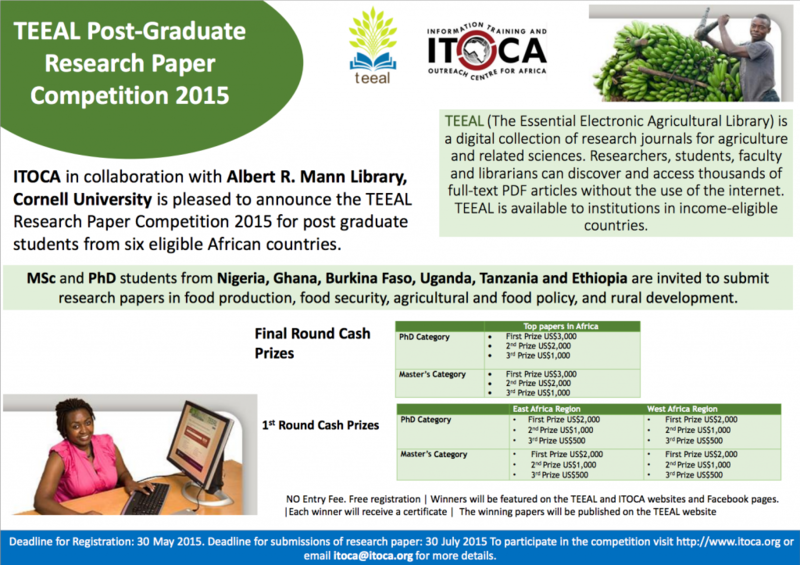 ITOCA in collaboration with Albert R. Mann Library, Cornell University is pleased to announce the TEEAL Post-Graduate Research Paper Competition 2015 for post graduate students from six eligible African countries (Burkina Faso, Ethiopia, Ghana, Nigeria, Tanzania and Uganda) to obtain TEEAL, The Essential Electronic Agricultural Library for their institution as well as prize money. MSc and PhD students are invited to submit research papers in food production, food security, agricultural and food policy or rural development. The deadline for registrations is May 30th.